Books for Beers at SXSW! If you’re attending the SXSW Interactive festival in Austin, TX next month, there’s no need to bother running around collecting stamps in order to win free books (who has time for that when there’s partying to be done?) All you have to do is buy one of the SitePoint crew a beer! 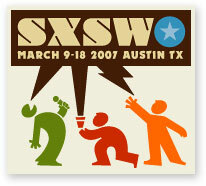 Yes, four representatives of the SitePoint team (including the two co-founders) will be at SXSW, sitting in on panels, gate-crashing parties and giving away freebies left, right and centre. We’ll have a truckload of cool schwag to give away: some of our newest books will be up for grabs, as will those SitePoint t-shirts that were so popular at Web Directions South. All we’re asking in return is that you buy us a beer, and we’ll give you your free book (and maybe a t-shirt)! The SitePoint crew will be easy to spot, as we’ll be wearing our SitePoint t-shirts. So come up and say G’day! And while I can’t say too much on the topic, I can reveal that there may just be another even bigger competition on the horizon (for all readers, not just those attending SXSW), and this one will have the most awesome prize up for grabs. But you’ll just have to wait for that one!